Luis Suárez has covered plenty of kilometres en route to Barça. He started out as a professional in Montevideo on May 3, 2005 at Club Nacional in a Copa Libertadores game against Junior Barranquilla. His excellent performances in the 2004/2005 season, in which Nacional won the league championship, were enough to win him a regular first team slot in the 2005/2006 season, in which his club retained the league title. Suárez impressed so much that in 2006 he was signed by FC Groningen in Holland, but he only stayed there for one year. He had already done enough to convince Ajax Amsterdam to make him part of their plans, and in the summer of 2007 he headed there. In his three seasons at Amsterdam, he won the Eredivisie, the Dutch Cup and the Dutch Super Cup. And he also won the Golden Boot as Europe’s top scorer in 2009/2010. By now, several of Europe’s biggest clubs were asking questions about the Uruguayan striker, and it was Liverpool who eventually secured his services during the 2011 winter transfer window. It was on Merseyside that he certified his name as one of the hottest properties in world football. He scored 82 goals in 133 matches, and last season his tally of 31 was enough to win the Golden Boot once again, this time shared with Cristiano Ronaldo. But the only trophy he won in his time with the Reds was a League Cup. After three and a half years at Anfield, he packed his bags once again. Next season, we’ll be enjoying his presence at Barcelona. 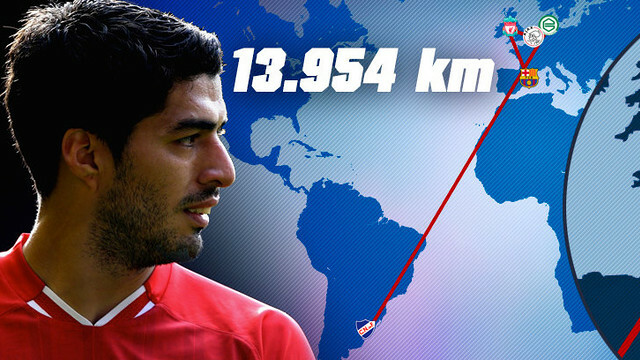 In total, Suarez has covered 13,954 kilometres in search of his dream. To wear the FC Barcelona jersey.